The hardest part with the wall was the scan which is here at MT, by the way. I had to extract every tid bit of it to produce the effect that I wanted. Also the side of the scan was cut off so I actually had to fix the side of the scan to fit the wall. I wanted the trees to match to the scan so they were each about 23 layers. I also softened and blurred the background a bit to give the illusion that the focus is of course on Sakura and Syaoran. I must give tons of hugs to ALL of my friends here because each and every one of you truly support and inspire me. Thank you!! And of course any comments and tips would be wonderfully appreciated--Thanks!! PLEASE NOTE: For all those who are interested--The white dots (dew drops) came with the scan. It is part of that style of art. I further incorporated into the wall to blend the scan better with the background. Reason:A great Sakura wall with charms and sweetness. This is really gorgeous-definately my favorite wall with this picture. It's actually up on my desktop right now! Great bg, lovely all-around. sad you had to delete it. like before this is so beautiful and so cute. love it! I am here!!! friends!!! fav!!! first the background is looking really good because the clouds you made are well done and suits the flowers a lot!!! the sky's color is matched with the scan as well!!! my god!!! so sweet and cutee!!!=)=)=)!!!!!!!!!!!!!!!!!!!!!! i like the trees and the bg a lot!! the scan is too cute too..! !hehe congrats!! Its a cute scan too. Oh wow!!!! So cute!!! Awesome job, I love what you did with this wally Emma. Cute scan too, great work, thanks for sharing. yay! its back!! i dont remember what i wrote for th last one but i remember that i liked this!! classic! it's a classic! some hard work done there too! 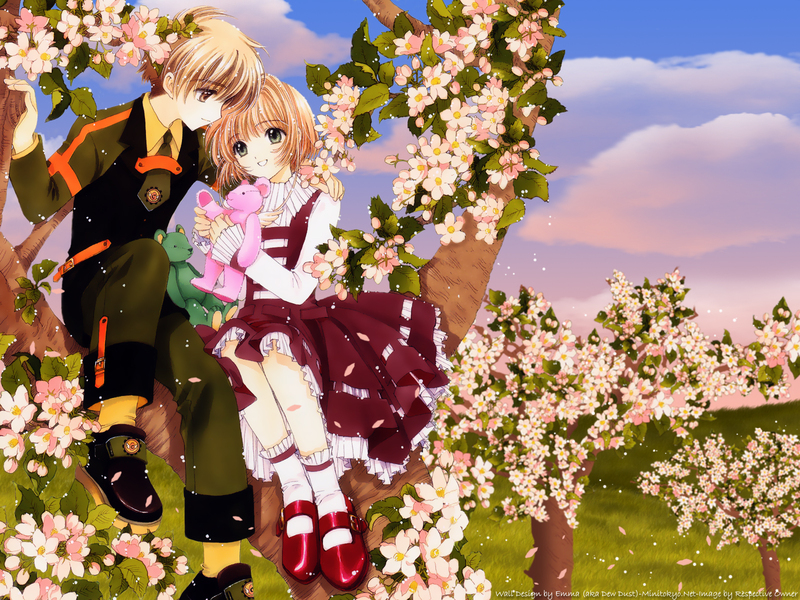 nice trees... & the lovable sweet syaoran & sakura... so cute!! oh, i wish i remembered my earlier comments, but you know i absolutely adored this wall! i also luv the warm colors of your sky, and i really liked your idea here to blur the background images to keep the focus on sakura and syaoran. and your extraction looks wonderful! syaoran and sakura sitting on a sakura tree.. lovely wall emma like always..
btw thanks for trying to add me to your friendlist, I think it will let you to add me if youre using firefox instead of explorer.. hum.. not sure why it happens..